When you are logged in with an account with administrator or staff member permissions, you can access the dashboard either by selecting it in the My account menu, or – with the admin toolbar enabled – you can click Dashboard in the toolbar. 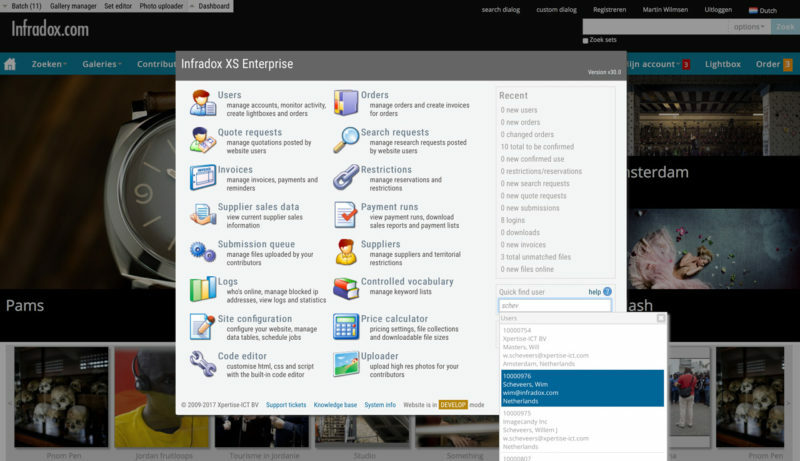 The dashboard functions as a menu for all your back office functions, it provides you with information about website activity (including quick links for details), it offers access to your tasks and it lets you quickly find a user account (see screenshot above). Using the “Quick find” function for user accounts. You can enter a contact name, organisation name, user id, log in or e-mail address to quickly get a list of suggestions. Click on any of the suggested user accounts to open the user account properties dialog. By default, the quick find function searches for accounts containing what you have entered. If you are not sure of spelling, then start your search with a question mark. This will use a “sounds like” algorithm. For example ?willemsen will find willemsen as well as wilmsen and any other similar sounding name. For more specific results, enter a comma between the contact’s first and last name, or the contact’s last name and a company name. E.g. wilmsen, xpertise or wilmsen,martin. You can also start your search value with a question mark for a “sounds like” search, even if you use a comma (as described above). E.g. ?willemsen,xpertis will find a user account with last name Wilmsen and company name Xpertise. Click on a name in the list of user accounts to open the user properties dialog. The user dialog lets you change the user details, and it also gives access to all information re the user. Click on the Activity tab to see searches, log information, what’s in the user’s cart, what’s in the user’s lightboxes, which files were previewed and so on. There’s also a dropdown box that takes you to all of the user’s orders, invoices, quote requests, search requests and restrictions/reservations. Click on the Contact log tab so view all logged contact entries, such as information about phone calls, e-mails and so on. You can also add new entries and create tasks (entries requiring follow up) here. If you want to work with files in the user’s lightboxes or cart, then go to user management. At the bottom of the user properties dialog there’s a link to go to the user management page with the user account already loaded. There you’ll find functions to add files to the user’s lightbox, to copy lightboxes between accounts, to copy files from the cart, to create orders into the user’s account and much more. As described above, you can view all logged contact info and tasks regarding a specific user account in the user properties dialog. If there are tasks that are assigned to you, you’ll see this at the bottom of the dashboard. 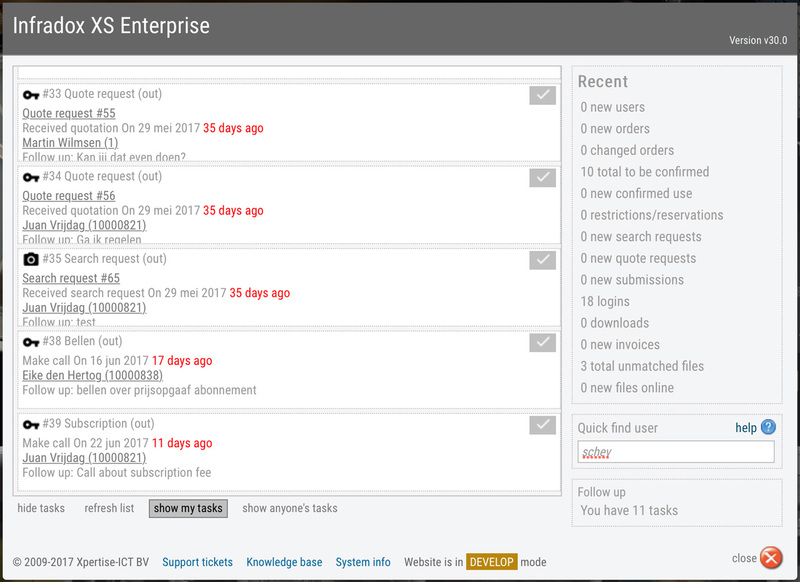 Click on the link to display all tasks (screenshot below). Tasks are listed in the order of which follow up was scheduled. To quickly mark a task as done, click on the V icon on the right of a task. To view the task details, click on a task in the list. The box on the right hand side of the dashboard show activity in the last 24 hours. E.g. new orders created, new users registered and so on. You can click on any of the links to go to the management page that lists the recent activity.